Wide rice stick noodles are typically used to make Kee Mao (drunken noodles) or pad siew. They are 3/8" wide, and after soaking get about 1/2" wide. Aside from being wide, they are identical to the more common but thinner rice stick used to make the famous "Pad Thai" . These are excellent quality noodles that you will enjoy very much. 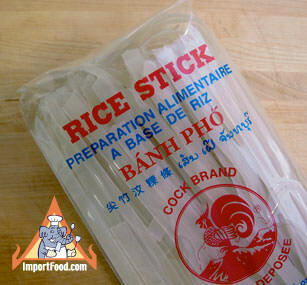 Made by Aroy-D, known for extremely high quality Thai food products. The noodles should be soaked in warm (hot to the touch) water for about an hour or so depending on your preference. Also see our video: how to make fresh wide rice noodles at home from scratch. Ingredients: rice flour, water. Product of Thailand. Kee Mao is a popular noodle dish served throughout Thailand and the direct translation is "drunkards noodles". They are typically made with a good deal of spicy heat, and we like this dish served with a cold beer. We also offer instant kee mao. Siew means soy sauce in Thai. This recipe is very tasty and savory but takes a long time to prepare. We now offer a convenient instant pad siew sauce although if you learn how to make the real thing from scratch, as described below, it should be worth the effort. Yentafo takes time to prepare, but it's worth the wait especially if you like Thai/Chinese noodle dishes. We offer a premade yentafo sauce to speed things up, and here we demonstrate how to make authentic yentafo from scratch. Yentafo has a unique flavor and distinctive red color. We used frozen fish balls and shrimp, but you can use other seafood of your choice. Small pieces of squid are often used. Try egg noodle instead of rice stick, for something different. As with any recipe, this one has changed with the times. Feel free to experiment. Lad Na is prepared in a two-step recipe that involves first frying wide rice noodles until they're just starting to get crispy. Then a sauce is quickly made and poured over the noodles. The translation of Ladna in English is "Pour on the Face". Lad Na is served all over Thailand, so it can be considered a national Thai dish, see a sidewalk version here that's over 40 years old. It's typically served not spicy, with Thai condiments on the side to "fix the taste" and make it more spicy if that's desired. In Thailand, broccoli or "pak kanaa" is typically used. It's very good with asparagus as well. Sign up to receive our FREE Thai recipe newsletter (monthly). Copyright © 2019 ImportFood. All Rights Reserved.